It is common to find Intermediate Bulk Containers (IBCs) being used for handling powders and granules in solid dosage manufacturing processes, from initial Dispensing through to Tablet Compression or Capsule Filling. However, when it comes to tablets, these are still traditionally handled in small containers such as drums, small kegs or boxes. 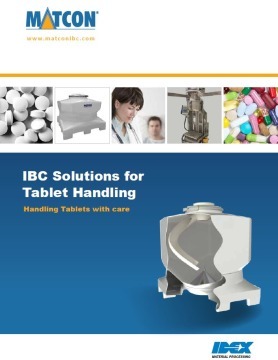 Handling tablets in larger, single containers offers significant benefits as compared to using traditional drums or small containers, including increased production throughput, reduced operator handling time, improved traceability, reduced risk of human error and improved operator health and safety. The combination of these benefits can significantly reduce manufacturing costs whilst improving production efficiency, quality and safety. Your message will be sent directly to Matcon Limited and will be answered at their discretion.